It was a Sunday, the 7th day of April 2019, when it rained heavily in Accra and about six people took their wooden pyjamases, as a result of the ensuing flooding. After all the running waters and floods have subsided, filth, garbage, waste, carcasses etc were all smeared over the streets of the capital city of our country Ghana. In the aftermath of this heavy downpour a colleague of mine mentioned to me in dismay, the black spots he sighted around Achimota and other places in Accra. Unhesitatingly, he started comparing our sanitation situation with that of United Arab Emirates, I reminded him to tone down to Rwanda, our compatriots in Africa because certain comparisons are odious. You can’t compare apples with garden eggs. In the olden days without any adept knowledge of waste management, MCEs and DCEs were christened in “Akan” language as “Tankas Panyin”. These officials used to drive throughout their jurisdictional areas in odd hours to inspect the sanitation conditions, filthy areas were immediately given the needed attention. Nowadays, these government officials are chauffeur driven in air-conditioned cars and enjoying in their well-furnished offices and residences, at the expense of the taxpayer. They are now man-made administrators managing procurement and awarding contracts. Sanitation is relegated to the waste contractors with absolutely no supervision. The overall supervision of all the assemblies in Ghana are trident without a pinpoint supervisor. On one breathe, the assemblies fall under the Regional Coordinating Council, on the second breathe, they fall under the Local Government Service and on the third breathe, they fall under the Ministry of Local Government. These create a whole lot of confusion when it comes to real supervision. In the cities of Ghana, as across much of the country, sanitation practices inscribe not only the hopes and fears of urban residents, but also the aspirations and failures encoded in colonial and post-colonial history. Adjusting to numerous challenges, the interplay of racist colonial zoning strategies, rapid post-colonial urban expansion, the withdrawal of public services amid the government’s liberalisation programmes, the increasingly abject character of the social contract, and the ongoing tenuousness of economic life and activity, urban environmental sanitation in Ghana has long struggled to keep pace with the historical dynamics of the country’s emergent metropolises, municipals and districts. Following the activities of a cohort of sanitary inspectors and their coercion in the 70s and 80s, sanitation in Ghana was better. The rural empires of ancient dwellers maintain good sanitation and clean environment, compared to the modernized urban centres of educated personalities. Recently, a very educative video prevailed in the social media showing aquatic habitat and terrestrial habitat. The former refers to the greenish surroundings of a river with various breed of fishes and the latter epitomised filthy township where people had become so grossed out with a noticeable mess. This town was excessively cluttered, muddled and jumbled with refuse, human waste was common in the streets along with cattle dung. The situation was too disgusting for human existence, passers-by had to walk with their scarfs around their noses just to block out the disgusting and foul smells that lingered in the air. These people had to watch where they stepped, they couldn’t take their eyes off the road. Just one lapse in concentration, the person could easily be stepping in a gooey and schmaltzy mess of giant poop. My heart gets saddened when the law of nature passes its judgement in such circumstances. Littering and indiscriminate dumping of refuse are usually caused by human activities. The consequential results of this behaviour is its contribution to choked-up drains and gutters. As a result, every heavy downpour causes flooding which often carries away human beings, the perpetrators of this menace. During floods domestic and other animals usually remain unhurt in their dwelling places since they do not partake in this indiscriminate dumping of refuse, which cause the floods. This is what we term real deliverance of natural justice by the law of nature. But the question is, as a people, what are we doing about this problem? We should put criminals to work. To me, we can use prison inmates to work laboriously in the streets and drains day in and day out. In some countries, including Canada, people are sentenced to community service. Nothing prevents us from replicating same in Ghana. Indeed, if we want our environment to be clean, dumping of refuse should be free of charge, rather, the government should introduce sanitation levy either in the form of VAT or on fuel to cater for waste collection and management. With this practice people may not be motivated to dump in running waters, gutters or elsewhere. To strengthen this initiative, waste bins should be provided in abundance in all streets of Ghana to aid easy dumping of refuse. In effect, this is an unfulfilled task awaiting immediate commencement. No excuses warrant our inaction and our non-performance is germane for an epidemic, the rippling effect will be an incessant pressure on the coffers of National Health Insurance Authority. We should all know that, environmental sanitation connotes a series of social and technical practices converging on the circulation and management of waste from human activities. In the cities, these practices are deeply intertwined with enterprises of public health and urban planning, and with discourse on urban governance and rights in urban life. The tasks facing policy makers and private waste contractors in environmental sanitation and waste management in Ghana are regularly conceived by genuine evidence of systemic failures in urban governance, and of consistent threats to people’s health. In a recent review of the expanding knowledge on experiencing the city’s rhythms and at its elusive and distributed margins, it was noted that a distinctive experiential category of discontinuity in relation to infrastructural aspects of the city, the integrity of roads and drains, the creation of public space, and the sufﬁciency of government planning, infrastructural projects are not simply geographical. The entire task of planning interrupts the conjoined enterprises of mapping and planning at their core and across their domain. Really, the planning practices such as those relating to urban sanitation with a complex confection of necessity and futility, captured in every aspect of their performance, right down to human activities in the streets, do not make any provision for waste control. In Ghana’s case, discontinuities of policy direction are evidenced of a purposive collapse of the domain of political action. Unfolding over the years, successive governments have failed us in filth control and their policies on waste management remain indescribable. Ghanaians query the nature of our country which has translated the euphoria of our wealth into a carnival of plunder, harassing its population with various taxes, spawning countlessly desperate strategies of dissimulation and accumulation and presiding over environmental ruin. Meanwhile Ghana’s despotic acts of recrimination got crystallised in global consciousness by punishing perceived law-breakers in the late 70s and early 80s by the military rulership. Our abject character of a political partisanship and civic spectacle in which filth are left to decompose by the roadside in proximity to authorities, need much to be desired. To some of us, the all-to-frequent impunity with which politicians enact laws to disrupt people’s livelihoods and exert force in the pursuit of less pressing issues with the dereliction of civic and social responsibilities mark the popular disengagement from necessity to policy incompetence. Within the jurisdictional area of Adentan Municipal Assembly, cars, motorists, cyclists, pedestrians and cattle utilise the streets equally, just as prevailed in other parts of the city. This is very predominant in areas of Ashalley-Botwe, Ogbojo and Dzen-Ayoor, all in Accra. The authorities are meaninglessly muted with unjustifiable reasoning in these reﬂections and the resonances of this attitude are yet to be known. The abundance of plastic waste with no signal of decomposition and its insistent existential murmur of the citizenry translates into a broader querying of political power of the chain actors of this menace. The government has shown no courage of banning the usage of plastics in Ghana, however, no cogent plans have been evolved to control this canker. Positing the re-introduction of sanitary inspectors to ﬁgure out levels of insubordination as the primary means of enforcing our civic values in the face of state excesses are not only overly due but to quench our long standing obstinacy. The National Sanitation Day has been unable to solve the sanitation problems because desilted gutters reclaim the waste leftovers on their embankments. The National Sanitation Day has been a monthly recurrence and ritual, consisting of a period of restriction on movement and opening of shops, without its full enforcement. Instead of researching to know why the desilted drains get back choked, the only knowledge available to the authorities is the repeated celebration of this monthly ritual which is not the ultimate antidote to control waste in Ghana. And yet, in spite of the interactions between the authorities and communal responsibility for sanitation, the implementation of this day across the topographical and imperfectly class-stratiﬁed zones of the contemporary Ghanaian city is tenaciously resistant to the mapping imaginary. Accra is long perceived as a city subject to environmental mismanagement and catastrophe. The rapid growth of Accra has outstripped the ability of the city to map and manage the infrastructural and ecological impact of new residents, and much housing is either inaccessible to vehicles, or vulnerable to seasonal ﬂooding that compounds the effect of poor waste disposal and drainage. The infrastructural development added to the population and land pressures confronting the city, and, in the last two decades, much of the ﬂood-prone areas formerly preserved as water bodies began to be occupied on a more permanent basis, due to the growth of extremely rapid rural-urban drift. It is difﬁcult to determine, given the opacity of political activity and how seriously formulations around policy sustainability are intended to gain traction. Policy sustainability as part and parcel of the city’s management has remained hostage to political machinations. In all, we should wage war against societal indiscipline and employ cultural imprecations upon collective and public failures to tackle the ecological and environmental failures in Ghana. At the same time, there should be emphasis on individual self-policing and neighbourhood surveillance on indiscriminate dumping. This should be reﬂected not only in popular banners, slogans and adverts as evidenced by the acrostic which opens this section of the article, but also in the voicing of behavioural expectations and the distribution of numerous waste bins across the country. An exemplar of the piecemeal nature of approaches to urban planning has demonstrated the outlines and shortcomings of this model of urban sanitation. However, it is important to note that there exists a political and public vocabulary around issues of sustainability and rights in making Accra the cleanest city in Africa, and that this vocabulary was mobilised and invoked for a variety of purposes, which unsurprisingly, do not always articulate well together. In Ghana, whenever somebody decides to be filthy in his place of abode, this can be done with impunity. There is zero mechanism in place to check, manage and control wastes in individual households. Virtually, there is an open lacuna in this regard. It is optional for an individual to decide whether to maintain a healthy or filthy environment. If we are so serious to control waste, we ought to inculcate it in the educational curricula, starting from the nursery right up to the university level. At the JHS level, it’s better to intensify the environmental science aspects in the thematics of the social studies syllabus, the same thing can be done in the SHS level, as well. In the university level and all other tertiary institutions, environmental science should be an institutional requirement before any student can graduate. As said earlier, the government should embark on massive adverts on sanitation nationwide, through radio, TV, billboard and newspapers, to educate people on good sanitation practices. In conclusion, we need to be watchful of the way people often throw garbages into gutters anytime we experience rainfall. Unscrupulous people take delight in this unpatriotic habit that could trigger ﬂood and outbreak of diseases, sometimes because of abject poverty. Government needs to deploy environmental ofﬁcers to check this menace. People feel that throwing their one piece of plastic bag indiscriminately will not make a difference to the cleanliness of the city as a whole. They forget to realise that if all the 30million Ghanaians feel this way then the whole country is going to be in an absolute mess. Appreciable levels of learning and exposure to cleaner cities or countries can make a person believe that this is as good as it gets. Most importantly it has to do with one major attitudinal problem. We refuse to accept that something is wrong with the country. The authorities should embark on rigorous public sensitisation and awareness on sanitation in all spheres of the country. My point is that you can only fix a problem if you acknowledge that there is one. But the majority of Ghanaians do not want to accept that our great motherland is a filthy mess. People remain unperturbed about the abundance of plastic waste in our places of abode. They are stuck in the mighty achievements in civilisation in the past. The authorities have inflated notions about how well the country is doing in terms of economic growth. The truth is Ghana is doing well economically in part because of reduced inflation, increase in GDP and other stuff they write in statistics, however, our sanitation problems can soon turn into a disaster if we continue to remain aloof. So once again, if indeed, we want our environment to be clean, dumping of refuse should be free, rather, the government should introduce sanitation levy either in addition to VAT or on fuel to cater for waste collection and management. With this practice people may not be motivated to dump in running waters, gutters or elsewhere. To strengthen this initiative, waste bins should be provided in abundance in all streets of Ghana to aid easy dumping of refuse. In so doing, this ubiquitous sanitation problems in the country could be reduced drastically if not fully eliminated. Next articleJulius Asamoah writes: Ghana beyond Aid, is it Achievable? 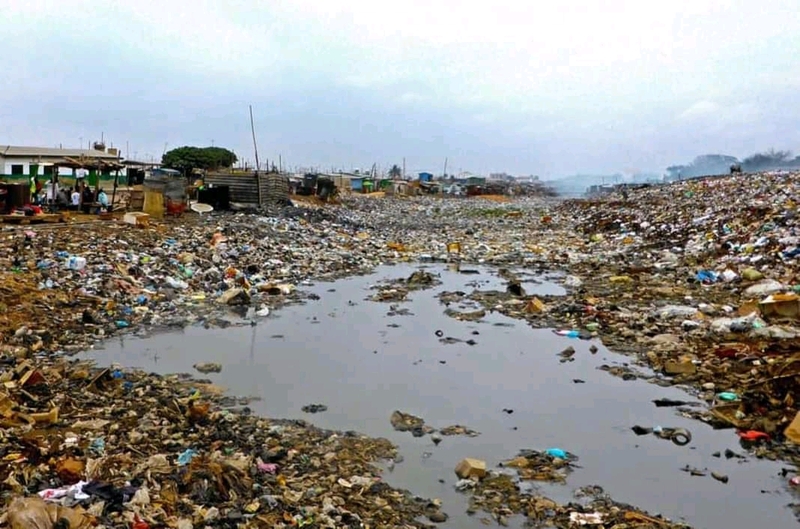 Accra’s sanitation woes; A dirty city, dirty people or inept authorities?